After a slower than expected start the Boston Red Sox head to the All-Star break 6.5 games out of the lead in the A.L East. How does the season look when broken down into segments? Hitting – The production isn’t what it was projected to be, but the lineup has potential from top to bottom. Bogaerts, Holt and Betts have given Red Sox fans a glimpse of the future , while Sandoval and Napoli have struggled to find the groove they’ve shown during their title-winning runs. Hitting with RISP has improved in the last three weeks and has undoubtedly been a key factor in the recent surge in offence. One of the biggest talking points in the second half of the season will be if David Ortiz can reach 500 career Home Runs before the end of 2015. He needs 19 in the second half of the season to reach the mark after hitting 15 through the first half. Second half key: Hitting with two outs has been a constant problem in 2015 and will need to be rectified fast if the club are going to reach their potential. Pitching – It was obvious on Opening Day and it’s obvious now – the Red Sox are a starter short. Clay Buchholz has found his rhythm and leads the side with an ERA of 3.26, but has landed on the 15 day DL with an elbow problem. Wade Miley’s eight wins equals his 2014 total and is half of his career high sixteen wins with the Diamondbacks in 2012. Rick Porcello’s early contract signing raises questions, yet the most common trend appears to be the inability to score runs in his starts. The acquisition of Eduardo Rodriguez has breathed life into Boston with his 5-2 record from nine starts demonstrating the importance of moneyball rather than buying a contract for the sake of buying a name. The inconsistencies of the bullpen have inevitably cost the Red Sox win however the potential addition of Joe Kelly in the second half of the season could be the move the side need to find the consistency they’ve craved. Second Half key: Quality starts. Given the fragility of the bullpen the Red Sox can not afford for starters not to get into the sixth inning. If the load on the bullpen can be reduced their effectiveness will increase. This will lead to more wins. Fielding – What is it about Rameriz’s and left field? Hanley’s efforts or lack their of to learn how to play the wall is probably the only thing more frustrating than Mike Napoli’s .193 average. Sandoval is making more plays than he is missing at third, which is a relief. Pedroia is in his usual Gold Glove form and Mookie Betts is showing that a lot will have to go wrong for him not to have a few of his own Gold Glove’s by the end of his career. Second half key: Working around the horn. Infield issues have been a concern for the Sox with Sandoval, Napoli, Bogaerts and Pedroia combining for 26 errors in 89 games. At a rate of 0.292 errors per game it doesn’t seem like a lot but it’s enough that it’s hurting the side. Baserunning – The Red Sox have stolen 39 bases in the first half of the 2015 season. Mookie Betts leads the side with 13, however he has drawn criticism for being thrown out at inopportune times. What that shows is that Betts isn’t scared to use the talents he has on the basepaths. Is he going to get thrown out at times? Yes, but more often than not (he’s 13-17 SB) he’s going to advance safely. Second half key – With the remainder of the side contributing for 16 steals, Betts need some help. Holt and Victorino have 5, Bogaerts has four, De Aza (who is still new to the club) has 3. If one or more of those four can step up and swipe 15-20 bags in the second half and Betts can stay the course , the Red Sox are going to be a threat to all they face. Second half key – Knowing when to pull the starters. Farrell has a bad habit of leaving starters in the game for an out or two too long, with the hits scoring game deciding runs. If he can get this right there is no reason the Red Sox won’t be in the playoff race. 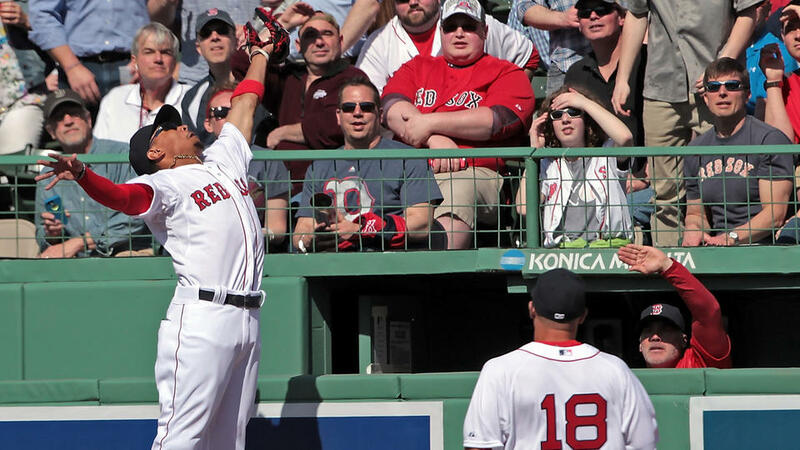 Playoff potential – Will the Red Sox see playoff baseball in 2015? I’m leaning towards no, but I’m still confident they will. If I had to put a number on it I’d say we’d make the playoffs on two out of three occasions playing the season out. There is no reason for the form of the last month not to continue. A few minor changes on the field and a trade or two before the deadline offer hope in what is a very weak A.L. East. 6.5 games out in a division without a standout side isn’t as big a mountain as 6.5 games out in any other division. Only time will tell but there is no reason to sleep on the Red Sox in 2015. This entry was posted in Published on xavierplayer.com, Written and tagged Boston Red Sox, David Ortiz, Dustin Pedroia, Hanley Rameriz, John Farrell, Mookie Betts, Pablo Sandoval. Bookmark the permalink.